International Theravada Buddhist University was opened in November 1998 beginning with Diploma classes as planned. Those who passed at least the Matriculation or equivalent with some knowledge of Pali or Sanskrit and Theravada Buddhist scriptures are qualified to apply for the Diploma in Buddha Dhamma. Candidates are required to sit for entrance examination at the Embassy of Myanmar in the country of their residence. There will be two papers, namely, one on English proficiency and one on General Knowledge related to Buddhism. We will timely inform the successful candidates to enable them to join the semester in November every year. In case you need any assistance regarding the joining of the University, you are advised to ask for necessary help from the Embassy of Myanmar in your country. Once you are accepted, please contact the Registrar Office of International Theravada Buddhist Missionary University in Yangon. Travelling expenses for joining the University will not be borne by the University. Once you join the University, free lodging and messing will be provided by the University. You may print out a copy of the application form from this Buddhism Internet Web Page or obtain the application form from the Registrar, International Theravada Buddhist University at the above address or from one of the Myanmar's Embassies or Consulates in the following countries. Asia - Bandar Seri Begawan, Bangkok, Colombo, Dacca, Hanoi, Hong Kong, Islamabad, Jakarta, Kathmandu, Kuala Lumpur, Kumming , Manila, New Delhi, Peking, Seoul, Singapore, Tokyo, Vientiane. Europe - Belgrade, Bonn, Geneva, London, Moscow, Paris, Rome. Middle East - Tel Aviv, Cairo. Background: The University is newly established in 1998. 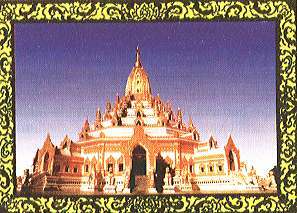 It is a permanent centre of higher learning of Theravada Buddhism. It is located on the beautiful site of the sacred Dhammapala hill near the Sacred Tooth Relic Pagoda, Yangon, Myanmar. Myanmar has carefully preserved Theravada Buddhism for nearly one thousand years. Now she is sharing her knowledge of Buddhism both in theory and practice with the people of the world to promote their happiness and moral well-being. For the first time, those who wish to learn Theravada Buddhist canonical texts and insight meditation in Myanmar tradition will have a chance to study them at the same institution. Faculty members are renowned Myanmar Buddhist scholars of high academic achievements who have profound knowledge of Pali canons. In order to overcome language barriers, language teaching is included in the academic programmes. The medium of instruction will be English. (a). To share the genuine Theravada Buddhism (the teachings of Gotama Buddha) with the people of the world. (b). To study and comprehend the canonical texts of Theravada Pitaka as approved successively by the six Buddhist Synods. (c). To abstain from evil deeds and practice good deeds. (d). To enable people to believe in Kamma and its consequences. (e). To know the differences between mind and matter. (f). To promote the four modes of sublime living (Brahma-vihara) which would lead to the establishment of peaceful and prosperous world. (g). To encourage and promote knowledge of the Four Noble Truths for enlightenment. The University will start functioning with a hard-core of Myanmar Buddhist scholars of More outstanding scholars will be recruited as the number of students increases. Depending on the availability of seats, more students are expected to join the University for postgraduate studies. Functions of the Academic Staff: The Academic staff of the International Theravada Buddhist Missionary University has to perform both teaching and research. Teaching includes conducting tutorials, seminars, workshops, symposia and excursions to historical sites. Research work will carry out by the academic staff individually as well as by the Department of Research. Anyone regardless of gender, race, religion, and creed, having educational qualifications prescribed by the University, can apply for admission to the University. However students are required to sit for the entrance examination as prescribed by the University to fulfill the requirements before joining the University. The University will open with the beginning of diploma coursed in 1998 and degree courses will be given in the following years. 5. must be fluent in spoken and written English. 1. must have obtained Dip. (B.Dh.) from this University or Sasanadhaja Dhammacariya or Sasana Takkasila Dhammacariya or must have passed the intermediate level with Pali or the intermediate level with Pali or the intermediate level with Pali or the intermediate level with Pali or Sanskrit subject from any University. 2. must be fluent in spoken and written English. 3. must have some knowledge of spoken and written Myanmar. 2. must have sound knowledge of spoken and written Myanmar. First Term: June to October. Housing: Lodging and messing for academic staff and students will be provided by the University. Library Facilities: The academic staff and the students have easy access to the Library of the Ministry of Religious Affairs. It is situated in the precinct of Kaba Aye Pagoda close to the campus. The Library holds 45,233 volumes and 12,265 palm leaf manuscripts. Steps are being taken to upgrade the library facilities. In response to questions relating to the application form for admission to Diploma (Buddha Dhamma), we would like to provide more information for your convenience. First, this application form is only for admission to one-year diploma course. Please fill up your admission form carefully and completely, so that the selection board can evaluate it correctly and quickly. The closing date for submitting application form for admission in Year 1, is 17th October, 1998. Entrance examination for the Diploma course were held on 15th October, 1998 at the Embassies of Myanmar abroad and also at the examination centre in Yangon, Myanmar. When you write your name, please underline your family name. Regarding the passport number, please include the date of issue and its expiry date. Your passport must be valid before joining the University. Once you are admitted to the Diploma course, Ministry of Religious Affairs will take care of visa application and its extension. As regards academic qualification for Diploma course, the applicant must have passed at least the Matriculation or equivalent or Pathamagyi examination. The Selection Board reserves the right to decide whether a particular applicant has met that requirement or not. In order to make the assessment easier, you should attach the true copies of your certificate, diploma, grading certificate, and recommendations. The admission policy of the University is liberal and flexible enough to get the qualified students for Diploma course. Priority will be given to foreign students. For language proficiency you should mention specially your English language skill. Please indicate whether your English is fair or good or excellent as the medium of instruction at the International Theravada Buddhist Missionary University is English. To fill up question no. 15, just write Diploma. In case you need further information, please contact the Embassy of Myanmar in your country or the Registrar of the International Theravada Buddhist Missionary University, Dhammapala Hill, Mayangone P.O., Yangon, Myanmar.